The Big Inning began in March 2016, with the goal to capture each day of baseball in the form of a single inning. And with the idea to make you think: What is an inning anyway? Baseball has no quarters, no halves, no periods. There are extra innings, 1-2-3 innings, clean innings, early innings, perfect innings, innings eaters and the easy joy of the seventh-inning stretch. We speak of pitching greatness by the inning: innings pitched, consecutive scoreless innings, perfect through seven innings. With no regard to any sort of clock, the inning is two sides of one coin, a top-and-bottom sports unit not repeated anywhere else. So if for no other reason than to follow the game in a new way, think of the inning as its own unit of highlight. And think back to a poem, its last lines, Hemingway in his high school years. Almost seems to make it scream. It seems as if t’would make him fall. Just one inning is enough. Chapman on the mound. Hernandez strikes out. Ruiz walks. Puig grounds to short. Russell to Baez to Rizzo. Double play. Cubs win. A birthday. Each one of them. For each one of us. Happening at once. Jammed together onto one calendar day. A four-hour party for a whole world of twins, newly made. Smiling the same smiles, unwrapping the same big gift. Sharing matching outfits in blue. Sharing it all. Caps with a red C stitched on. Shirts in pinstripes or blue; white with a large-print W. With faces and names, stories and eras. Ron Santo, Ernie Banks, Kerry Wood, Anthony Rizzo. 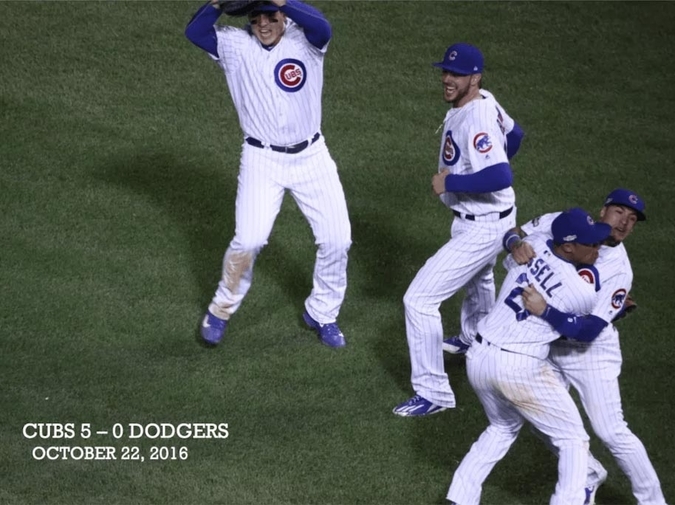 The Chicago Cubs—they’ve beaten the L.A. Dodgers in six games here in the NLCS. Surrogate opponent for a double-lifespan of demons. The they-who-can-more-comfortably-now-be-named. The Bartmans and goats and Sianises and cats and 1984s and 2003s and Alous and Mannys and Murphys and Dustys and all the rest of the voodoo gang. Is there still a curse? Was there one? No one’s really ever been sure, with Camp Cub Fan long split in two, the optimist-denialists and the pessimist-neurotics—united now under one single thought: They… won? The pennant? The few handfuls of the dieharders diehard enough to know anything have kept dutifully mum on the subject. The curse whisperers, the old-timers, the longest of the sufferers—spooked by hardly understood prospects of incidental invocation. Of a curse whose laws have gone unexplained for years, whose rules exist on unstable wavy planes. A jumbled supernatural logic, bouncing off the walls of heartbroken Cubbie universe. But something’s been put to bed, an ending or a beginning. Something has occurred. In 2003, the containment grid was shut down. Turned off. Releasing all ghouls and baseball gremlins of Cubs hell into some city-wide, melting disaster. And then. In stepped the doctor. Theo Epstein. The ghostbuster. Taking aim, firing, stream-crossing, trapping, containing—just long enough for a quick one while billygoat’s away. Alright! he says, someone says. They load up the proton packs. He, Jed Hoyer, Eddie Vedder, Bill Murray. From one of the luxury boxes above the field. They let it rip. There’s one out in the ninth. They have a win on the brink. Confident but nervous. As if everyone there at Wrigley expected some last-gasp second act of the curse to perk up, a deception and then a return, the Stay Puft Marshmallow Man tromping down Clark Street, tearing off the Wrigley rooftops, the rafters, the center-field scoreboard and ingesting Aroldis Chapman in one big devastating gulp. The World Series is cancelled this year, a stadium announcer would say out of the rubble, on account of the apparent apocalypse, descending now onto Chicago. But no. It didn’t happen. The Cubs held on. They won it. They won it! We’re all in agreement here, we think, pinching ourselves every minute, sure as far as we can tell, pretty sure, sure sure, that some long era just came to an end. That they took it, four games to two, winning in six games over the great Clayton Kershaw. After the game, there was music. Hugging. Dancing and rejoicing. Awards and speeches and champagne and beer and smiles and crying and no one leaving their seats for a packed-house Wrigley staying well past the final out. There was the lone flag raised atop the scoreboard. Every team in the National League long pulled down for winter, two left for one final night, and then went Dodgers down the pole. Cubs down too and one last flag raised up. White, rectangular, blowing in the wind above it all. A big blue W on the face. There were high fives. Hundreds of them. Up and down the ramp. On Waveland and on Sheffield. On every street on the Cook County map. In White Sox Land, too, we think. There was Pete Rose. There was Frank Thomas. Alex Rodriguez, surveying the live scene on the Fox Sports postgame set, waving a blue towel, barely able to hear. Cub fans on the stoops, in the windows, on the roofs, in the red-line trains. Criss-crossing threads in a giant quilt of blue, milling around in disbelieving joy. There was the ride home, down Addison. Onto Lakeshore Drive. Cars honking on Halsted. Beeping and whooping out the sound of a win. Cars off in a parking garage somewhere, honking without a driver, without the engine on. Cheering so hard they forgot they were inanimate. There were the callers on ESPN radio. Guys talking about old WGN games watched on the carpet floor at their grandma’s house, old women recalling the leanest of the lean years, people rambling and stammering, anecdote floods pouring onto Chicagoland’s airwaves, broadcasting whatever pain’s opposite may be. And a brand new Cubbie bandwagon, constructed out of the woodwork. There was Gary Pressy on the ballpark organ, before the game. Doing a quickfire run-through of the greatest hits of the ‘80s. There was John Cusack in the front row, hanging thankful fingers through the backstop netting, to be one inch closer to the moment. There was Kyle Hendricks, walking onto the mound for a spot in the storybook, with the face of a kid consigned to chores for a month—pulled from school to run the dishwasher, clean the bathroom, mow the lawn, pitch a near no-hitter to put the Cubs in the World Series. Stoic some have said, not quite on the money. Determined, yes, focused, yes, but more blank even than those. The kind of focus dead set on nothing else but hiding its own intensity. The face of an over-achieving test taker, netting a perfect 100 without a smile, sure they were stuck in B+ land. And out of the Wrigley Field speakers, a minute before game time. Phil Collins’ voice singing the words everyone in Cubworld has been thinking. And I’ve been waiting for this moment, for all my life. Those last four words put goosebumps on every fan in the park. We’re here. On the night that the win can happen. The hump of all cursed humps can be approached, summited, traversed. A few hours away from an ending. The feeling that history can happen, that the dead-end of elimination is on the table, a Dodger season might end, a Cubs campaign might continue, that the early-game safety of Game 1, Game 2, Game 3 is no more. There’s tonight, maybe the next night, and that’s it. There was the first inning, when Clayton Kershaw gave up two quick runs, compounded by another in the second. Another in the fourth. Another in the fifth, done by the sixth. The game was over then and there in the first five minutes. 2-0 Cubs unbelievably ahead. With the final eight frames a mix of formality, celebration, crossing of fingers and knockings on wood. There was Paul Simon on the ballpark speakers between innings. There were the lyrics that were perfect. Then it was the ninth. The final two outs gained in a flash. Leaping on top of the green plastic seat, jumping so much it should’ve broken, grabbing the metal railing along the upper-deck aisle, looking around at the loveably losing baseball world we’ve always known pausing for just a moment, changing the tilt of its axis, letting in some room for winners to breathe, shining warm light onto this northside ballclub, reinstating a season we were never sure ever really existed. Seventy-one years of cold winter marked in the ice. We’re in the World Series. We’re in the World Series! We’re IN. The World Series. We’re in! We didn’t prepare for this step. This space on the calendar. This whole fantastic unreal too real surreal thing. More baseball, for Cub-fan nation, for the first time in 71 years. Brendan Donley is a writer from Oak Park, Illinois, and recent graduate from Columbia University. His work has been featured in or is forthcoming from The New York Times, Byliner, Pithead Chapel, and VICE Sports. Enjoy the rest of his work at The Big Inning, a home for long-form baseball columns. You can follow him on Twitter @big_inning.